→ Incomplete means that horses with one copy of the variant (LP/n) will show a less pronounced phenotype than horses with two copies of the variant (LP/LP). Characteristic traits: white stripes on hooves, visible white sclera in eyes, speckled/mottled skin around the eyes, muzzle and genital regions, progressive “varnish roan” coat color. Alone, Leopard Complex Spotting (LP) may only show the above listed characteristics on an otherwise solid-colored horse. Depending upon interactions with other genetic variants, a wide variety of phenotypes are possible, such as “snowflake”, blanket, snow cap blanket, near leopard, leopard and few spot leopard (from minimal to maximal expression). The Pattern-1 (PATN1) variant is necessary to see large areas of white. 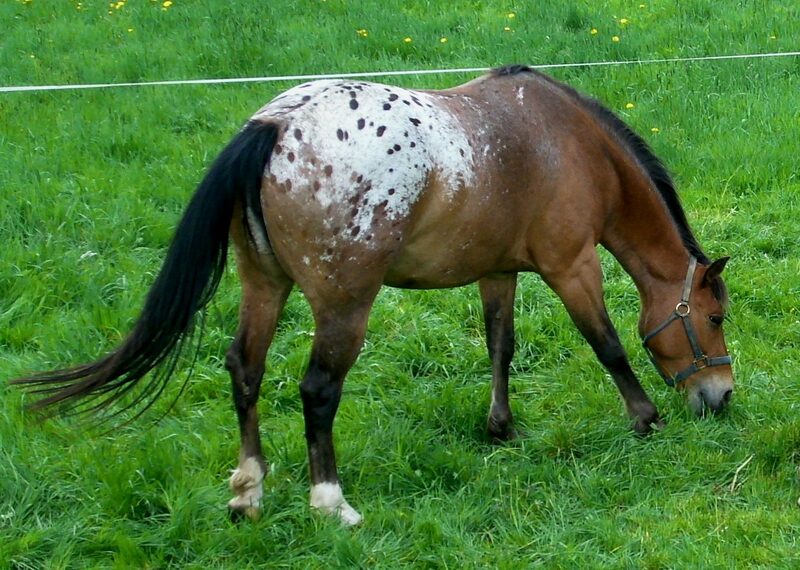 A horse with one copy of LP (LP/lp) will show spots on areas of white (near leopard, leopard), while a horse with two copies (LP/LP) will not have (m)any spots in the white areas (fewspot). Leopard-Complex is associated with the Congenital Stationary Nightblindness (CSNB) if two copies are present. 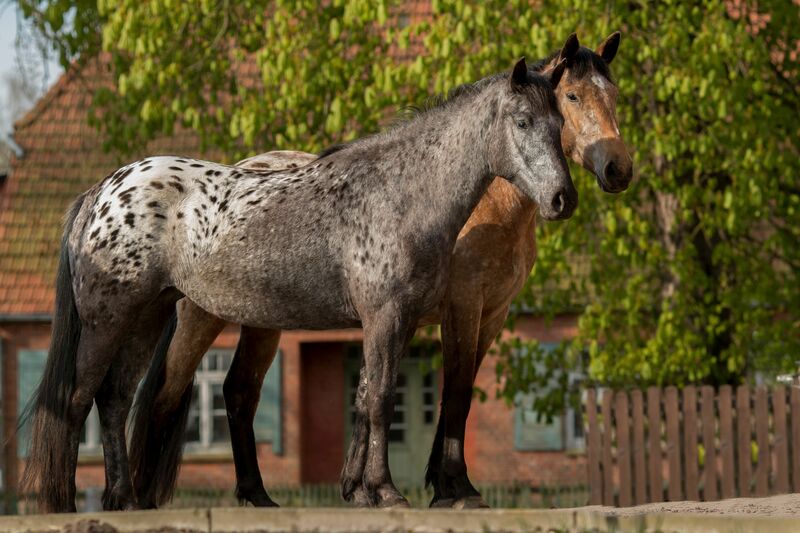 LP/n The horse has one copy of the LP-variant → Leopard pattern with wide variety of phenotypes (e.g. frost, roan, blanket, leopard). LP/LP The horse has two copies of the LP-variant → Fewer leopard spots on white areas. Horses are also affected by CSNB. → Other genes may influence the phenotype. 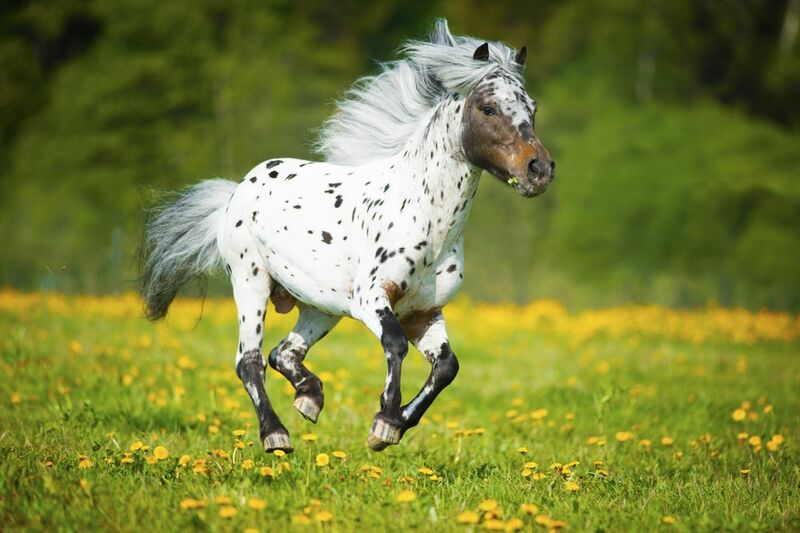 Pattern-1 is one known mutation that alters the amount of white in leopard horses. Test information: This test detects an insertion in the TRPM1 gene. Bellone, R.R., Holl, H., Setaluri, V., Devi, S., Maddodi, N., Archer, S., Sandmeyer, L., Ludwig, A., Foerster, D., Pruvost, M., Reissmann, M., Bortfeldt, R., Adelson, D.L., Lim, S.L., Nelson, J., Haase, B., Engensteiner, M., Leeb, T., Forsyth, G., Mienaltowski, M.J., Mahadevan, P., Hofreiter, M., Paijmans, J.L., Gonzalez-Fortes, G., Grahn, B., Brooks, S.A.: Evidence for a retroviral insertion in TRPM1 as the cause of congenital stationary night blindness and leopard complex spotting in the horse. PLoS One 8:e78280, 2013. Pubmed reference: 24167615. Doi: 10.1371/journal.pone.0078280. One of many possible phenotypes of the Leopard-Complex. Leopard with a spotted blanket. Leopard with blanket and varnish roan.